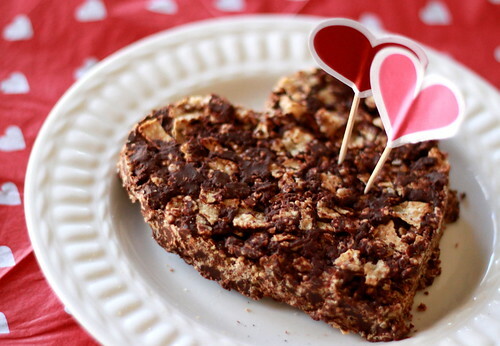 No-Bake Cookie Crumble Cake. What a sweetheart. Today, we get our art on. 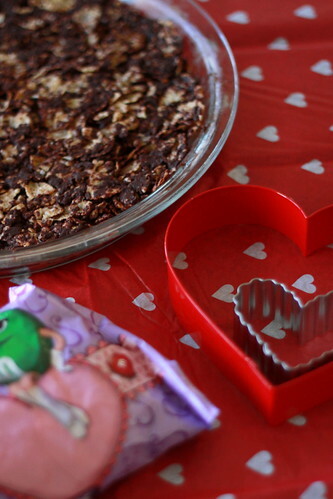 In the spirit of Valentine's Day and making homemade gifts, here's a ridiculously easy, hassle-free, and kid-friendly no-bake project. 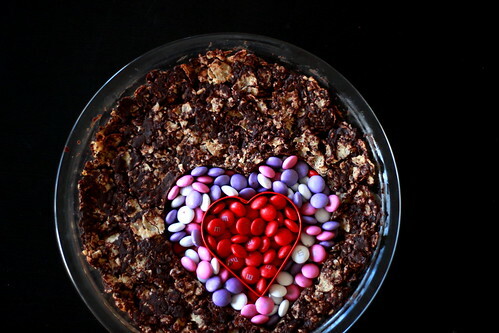 One of the things I love most about no-bake recipes is you get to play with food, and it's hard to screw up (although I should take that back because of this).This No-Bake Cookie Crumble Cake is BIG on chocolate flavor, and it's a pretty little thing too. And most of all, it's a great way to bust out your art skills and have fun! 1. Melt baking bars on a bowl over a pot of simmering water. Stir occasionally until completely melted. 2. Stir in butter and condensed milk. I made mine really chocolate-y so don't be afraid to add a little more sugar, like maybe 1/3 cup condensed milk (instead of 1/4 cup). 3. Gently stir in toasted rice flakes. 4. Spray pan or plate with cooking oil or butter. Press mixture on it and set aside for two hours (or refrigerate for 1 hour). 5. 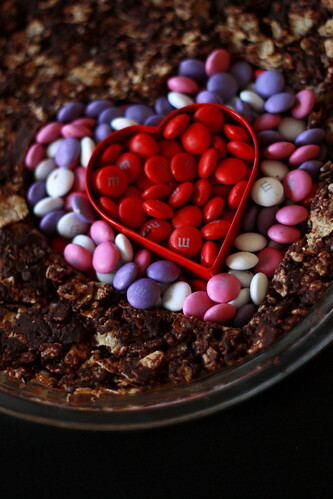 With a heart-shaped cookie cutter (or your superb cutting skillz), make a heart-shaped hole and fill with m&ms. As my nephew Logan likes to say, "ta-dah!" Chocolate and I New York starts today! I feel like I'm going on a hot date later and I have nothing to wear. Eep! This is the first of Heart Art series. Stay tuned for more every day this week. And if you got some of your own, send it over at marriedtochocolate@gmail.com and I'll show it off for you!